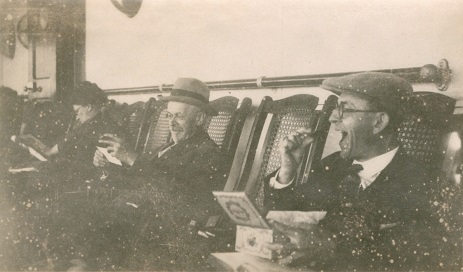 ON THE HIGH SEAS OF THE ATLANTIC -- Muhlenberg College professor Dr. Preston Albert Barba (right) -- of the family of Jesse and Elizabeth (Baer) Fegley -- passes time aboard the S.S. Bremen in 1925 during one of his 40 annual research trips to Europe. His writings provide a remarkable window into the German cultural values which our people brought to Pennsylvania, passed down among some generations in the eastern portion of the state but lost by those migrating westward to the Pittsburgh region and beyond. Preston taught at Muhlenberg for nearly three decades until retirement in 1951. He founded Der Deutsche Verein -- "The German Club" -- open to students where "the speaking of German is done as much as possible," said the 1926 Muhlenberg yearbook Ciarla. "German songs are quite in vogue and speeches on various interesting and educational topics are given by different members throughout the year." Among his books was They Came to Emmaus, 1939, considered the standard history of the Lehigh County community. For 34 years, he edited a weekly column in the Allentown Morning Call, entitled " 'S Pennsylvanisch Deitsch Eck," considered the "authoritative ... recounting the history, customs, and traditions of the Pennsylvania German." His wife Eleanor was an artist who illustrated many of his articles and was a traveling companion. When he died in 1971, the Morning Call said he was "one of the foremost authorities on the life, literature and lore of the Pennsylvania Germans." In this image, he sits with Mrs. Nagle and Professor Lambert. He appears to be ready to take a bite of a snack from the box he's holding. Or is he laughing?